I recently picked up a set of the original 77-11L (77 series 1). Im not sure how they are compared to the current "classic 11L's" but for my set up they are fantastic. The set replaced my Snell K/ii's, and so far no regrets. Alos took some sets of B&W out of the standing. Placement is key with this set, but if proper placement is achieved the sound stage really opens up. Fantastic lower end, very accurate lower end, not booming at all, but does not lack in any manner. The top end is nice and clear but not shrill. Simply a joy to listen to. For most of us we use the "smile test"... lets just say i grin non stop when i have music playing on the 11L's. The cabinets just oozes quality, amazing finish. I picked up the black piano finish, and I still find myself just staring at them. Nice and heavy as well. The drivers, nice cast baskets, and the motors (magnets) though not shielded, house a nice hefty magnet. The Kevlar cones are on point. My B&W 686's with the 5" Kevlar drivers have nothing on the Quad drivers. I was quite impressed with the size of the sound stage on such a small size speaker. Like I stated above, placement is key with this set, but if you are in the market for small speakers, that is true of pretty much any and all you will find. As a collector, and a music lover I can say this is one of my favorite sets of small speakers. If you have the ability to find a set of the 77-11L original series, run dont walk. well worth the investment. Simply put .. dollar for dollar the Quad 11L speaker is THE best in the marketplace. Period! Stop reading reviews of other speakers. Go visit your local retail outlet that carries them, reach into your pocket and buy a pair and then go home and enjoy a lifetime of crisp, clear, fidelity in music. The biggest challenge will be what color cabinet to chose. These are excellent speakers...full stop. Purchased a very nice pair of 11L originals from a well known auction site in fabulous yew finish. They are compact and beautifully finished. 4 terminals per speaker to which I run 4 x monoblocks. 2 per speaker. They are compact and fantastic on rigid stands. Can be placed fairly close to a wall (20-30cm) and toed in slightly for best imaging. I can only describe the sound as breathtakingly lifelike. The detail from the soft domed tweeter is revealing yet never bright or edgy. The little bass/mid cone delivers a detailed mid range,acoustic guitars are just amazing, and plenty of tuneful bass from their diminutive size. Some reviews out there descirbe them as being dull or having an edgy midrange when driven hard. Let's face it, these are small speakers designed for smallish rooms and are never going to deliver party levels of sound. Having said that, they go loud without fatigue and deliver a fantastic spread of sound across the room with a tremendous sense of air around each individual instrument. Very neutral in delivery. At the time of writing this review I have been listening to my Quad 11L2's in the beautiful Rosewood finish for about 6 months now. I must say I have to agree with all the hype these speakers receive. I have been switching monitor speakers in and out over the last ten years. Some of my previous coveted monitors were Silverline SR 12's, Totem Rainmakers and Von Schweikert VR-1's. In listening to the Quad's I can honestly tell you they best them all. These simply are the best monitor speakers under $1000 PERIOD!!! Sure you can find better out there but you will have to spend upwards close to $2000 (not in my budget!) These would include monitors from Merlin, PMC and Proac...all around $2000 and up!!!! The Quad 11L2's just totally disappear and allow the music to be heard. They are one of those speakers you can build an entire system around and be very happy. I first was using an NAD C340 integrated with these and the music was incredible through my Oppo bdp 83SE....but then I upgraded from the NAD to an Exposure 2010S2 integrated and WOW!!!! The music is so smooth, detailed and refined and for a monitor speaker I feed there is sufficient tight bass for an overall musically engaging experience. My compliments to Quad for making such an amazing speaker!!!!! Sound is very nice, well rounded and well tempered with no flaws at all. In fact they put my economy sub-woofer out of work as it didn't harmonize. I don't however experience the exuberance from the other reviews. It's worth the money I paid and maybe twice more as new and unused. Playing on renovated and upgraded Quad 405-II and 44. incl new OP_AMPS of best quality and placed on stands. I have no doubt they will serve a lifetime for many people. Given the size and price it's brilliant product but it won't replace somewhat larger high end speakers. I recommend these to anyone on a budget requiring honest sound reproduction. Personally I could at my age of 50 do with a raised tweeter, but that would be against the linear principles probably. Great sound for it's modest price. Incredible imaging. Nice, "British" sound. Beautiful finish. First, the speakers image extraordinarily well. In this respect, they remind me of an old, coveted pair of Celestion SL600s. The 11L’s ability to render a wide and deep soundstage for a speaker at this price is simply amazing. Center fill is stunning, particularly on vocals. On a couple of occasions, while listening to two channel music, my wife has commented that she really loved the sound of “the center speaker” (also from the matching L series). I always enjoy seeing her reaction when I tell her it isn’t playing. The image she perceives is coming only from the left and right speakers. There are simply no gaps in the center image. And vocals are dead center. Close your eyes and it’s as if they’re right there singing to you. The speakers simply disappear. Chamber and Jazz music is also very good on the Quads. As to tonal balance, the Quads possess a very smooth midrange, but can be a teeny tiny bit dry on the extreme top end, depending upon associated electronics. I would characterize them as being more neutral than warm. At the same time, they are not analytical, sterile, or cold. They are also amazingly transparent. I have owned electostatics, and the Quads really approximate their level of transparency for a box speaker. Similarly, they are also quite fast in terms of transient response. Now the less than stellar attributes: As I mentioned, these are sins of omission and are certainly to be expected based on price, cabinet size and the inherent limitations due the size of the drivers. As you would no doubt expect, bass response is the 11L’s Achilles heel -- they simply cannot move the air of a larger floor stander. If that’s a show stopper, look at the 21L or beyond -- I hear that model is quite satisfying for those needed a fuller bottom end. That said, I don’t want to sell the 11L’s bass performance short -- what’s there is pleasant, free of boom and goes surprisingly deep; but if you’re into Crunk, Reggae, Organ Music, etc., look elsewhere unless you have a quality sub in your system. I am, in fact, running the speakers with a sub crossed at 80Hz and they mate fairly seamlessly. If you’re in a similar boat, this may make a jump to the 12L unnecessary. Second, the speakers are very revealing despite their modest price. Initially, I powered them with an old pair of Adcom GFA 565 monoblocks. I have since upgraded to a McCormack DNA-125. Some may find it odd to pair a $2K amp with a pair of sub-$1K speakers, but believe me, the Quads shine a spotlight at whatever you throw at them. That includes bad recordings. So be forewarned, don’t expect to hear what these speakers are capable of with sub-standard electronics. And if it’s a great recording, sit back and enjoy; but if it’s a bad one, the Quads are not going to glaze over its sonic deficiencies. My advice is to pair them with neutral to warm sounding electronics. An appropriately powered tube amp would really make them sing. Third, the speakers are not up to par with larger floor standers in terms of visceral dynamics. Though this is mostly a function of its bass limitations, you’ll still notice a lack of “slam”, across the entire frequency spectrum. This may also make the speaker less than ideal for cavernous listening / home theater rooms. Again, a sin of omission and the speaker excels with nearly all the musical genres you throw at it. But for the bumpin’ and thumpin’ stuff, you’ll be left felling a bit wanting. Lastly, I wish Quad had made the 11L more efficient. Granted, 86dB with a 6ohm load is not a beast, but it does limit amplification choices. Had Quad made the speaker 8ohm and over 90dB efficient, it could have really opened up some interesting pairings with low output tube amps (i.e. SET designs) or digital / Class D amps. SO reading between the lines, don’t skimp on the juice. The product literature says you can use as low as a 30 w.p.c. amp, but I think that would be underpowered if you plan to listen to the speaker at any volume and would offer limited headroom for movies (if you’re using the speaker in a home theater setting). In summary, I am extremely pleased with my purchase and would not hesitate to recommend them. I was lucky to pick up a pair of the discontinued yew finish for a great price. The cabinets, with their 7 coats of piano lacquer, are simply beautiful. I was also able to purchase the matching 11L center in yew. Together, they make a wonderful speaker ensemble that excels on both two-channel music and home theater playback. Even if the 11Ls were twice the price, you can’t go wrong. Martin Logan, Mirage, Snell, Celestion, Boston Acoustics. Midrange beautiful, bass accurate and realistic. Musical without being thick or too warm. Fluid and transaprent. I'd always wanted a pair of Quad 11L's but never really having the spare cash I'd accepted they were not for me. A couple of years ago I'd bought a pair of Wharfedale Diamond 9.1 standamounts to partner a slightly forward and agressive Musical Fidelity X-80 amp. The 9.1's had won Speaker of the year and were classy, full and musical. A couple of months ago whilst playing around on the internet I saw my local Hifi store had an end of line in the limited edition teak laquer finish Quad 11l's on offer at £199. Bingo!!! Fifteen minutes later I was in the shop credit card at the ready. This was pure desire but better late than never. 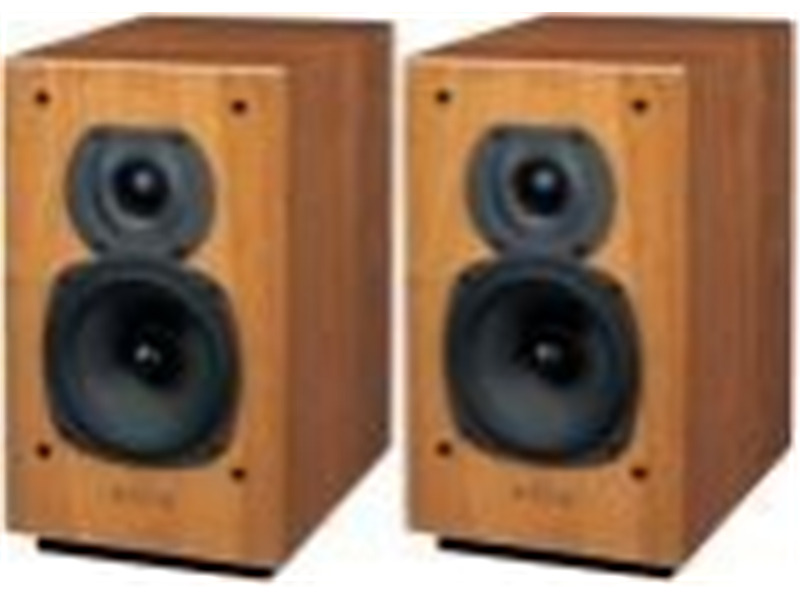 There is a great deal of similarity between the Wharfedale 9.1's and the Quad 11L. The 9.1's have really classy rich but fluid sound that's really hard to dislike. They'd mastered the X-80's slightly aggressive presentation and I was really happy. The Quads though are a class act. They look AAA111, really beautiful laquer finish. The sound though is nothing sort of magical. Wherever possible the speakers bring a close up feel. They add width and depth to the soundstage. For a small speaker bass is real quality. Not in the depths but in the quality. Bass guitar strings have firm and recognisable edges and all bass is solid. Nitin Sawhneys, Anthem Without a Nation on the Beyond Skin album test out bass. It will show it up for good or bad. Is the bass wooly of solid? Mobile or slow? The Q 11L's have the edges and movement to excite. Midrange and vocals are perfectly forwards in the soundstage. Melody and musicality always prominent. If the upgrades are anything like these they will be magic. This is one happy chappy. If they come your way get them. Although they are great out of the box, after the 50 hours burn in time they open up to give sheer pleasure. they need Alot of power to handle at there best. When i went to the store to compare speakers to eachother i was first not impressed of the 11L's at all, the finish is outstanding but they did not sound very well i remember. They where hooked up to a Harman Kardon surround Reciever and since i have more power at home i thought why not try them again, i asked the dealer to use something more powerful and we tried them with quad's own preamp and amp. The speakers did sound alot better with better cd player and amps etc, and when i went back to the store with my own Preamp and Monoblocks they sounded even better. My advice to people who want to listen to these speakers is to dont underestimate how much better they get with more power. Even the guys at the store was impressed of how they sounded, and we did not think the 12L played any better. The 11L's did sound more living and they are very fast and very exact. I used my Denon Dap - 5500 preamp and 2 Poa 6600A Monoblocks (rated to 260w rms in 8 Ohm). i also use a Colossus Balanced cable betwen preamp and the amps. The way in which they simply allow the end user to hear what's on the recording in a more beautifully and textured whole as opposed to simply hearing a sound of Hi Fi for the sake of it. Somewhat lacking in the bass - but considering what one has to pay in order to get a true 35 - 20Hz is unbelievable. Just think Wilson Audio WAMMs to get some ideal as to where I'm going with this. And even then - what quality of Bass is seriously there? for this sort of price. In other words - More money can at times only buy one more SOUND - not more ENJOYMENT. I just wanted to add my opinion of these beautiful sounding little Mini-Monitors for the rest of the world to see. As I'm still in the process of breaking these in, as I've only owned them for over a month. Yet I can state for the record that I consider them keepers to say the very least. As I'm using mine with a tube integrated amp - I find their sound to be first and foremost one of refinement and balance, I beleive that all to often many of us tend to place to much emphasis on what something isn't doing as opposed to just what said speakers are doing right. I hear these speakers as a very sound alternative to either my much beloved ProAc Tablette Refernce 8 Signatures or Audio Pyhsic Step SLE's or Harbeth Acoustics HL - P3ES2's - and can also find a sound which I consider very lovely indeed. These have a sound that I consider to be very very very Musical and more then capable of pleasing those whom are willing to overlook their price and simply allow oneself to merely hear what these things are very good at doing - which is to my mind - offer a better sense of the innermost texture and nuances to the very fiber of the recordings themselves which I also consider to be a quite rare ability once again considering their cost, yet if one is willing to have an openmind and the ability to simply listen to these as a means to hear what is offered through some of the Worlds best sounding Mini-Monitors yet at a slightly lower cost, one can't help but be pleased with what's here. As opinions are often nothing more then ones view of what sounds best to said user in the end, I can only say that if one prides oneself of being a Music Lover First and foremost as opposed to an Audiophile Per Se then one shall be able to fully enjoy what Beautiful Music these speakers are capable of rendering to begin with. Yes we all often talk about a desire for more bass output or this or that, but please keep on mind that one can often ask for the wrong things at times and simply not understand the differences that lie between a better bass and/or more bass. I'm simply one of those people whom tend to love a fast and very agile mid-bass of say 50 - 55HZ on any given day of the week as opossed to say a false sense of someones 40 - 20Hz from a cabinet which isn't braced properly and allows for unwanted cabinet resonance and boom. All of this to say that I consider these as very worthwhile speakers to those whom simply do not care to continue wasting money on the hardware side ot the Audio hobby and would much more perfer to continue adding to what I've always considered a more important part of this hobby which is often overlooked because one isn't in fact pleased with what one owns more so then simply having a collection of some of the most costly hardware in the world and only a very few selected Audiophile approved recordings no matter the format to play on them. Enjoy what many do consider a very Musical Little Speaker - and I myself am not willing to go against the grain here, as I think that these things sound Beautiful indeed. Great. A very honest and worthwhile person to deal with. I couldn't recommend anyone else higher then Walter. A ++++++++++++ and then some. ProAc Tablette Reference 8 Signatures and/or Tablette 50 References - Audio Pyhsic Step SLE's - Harbeth Acoustics HL - P3ES2's - Reference 3A Dulcet. This was the first audio "upgrade" I ever made, an attempt to combat the harshness in my system. It went some way to doing so, and I enjoyed the neutral sound from these Quads. The finish on these speakers is superb, far better than on my 2 and a half times the price Dynaudio's. I soon upgraded these speakers when I foolishly bought some 12L's off ebay, and immediately regretted doing so, realising I would have been far better having spent money on a sub. The Quad's are lovely in the mid's, but a bit short in the low's, and quite lacking in the highs. I think of them quite affectionaly now as they were my first glimpse of "high-end".